Wearing braces is all about the future: you undergo many months of treatment to gain a lifetime of better mouth function and a more attractive smile. In the meantime, though, you'll have to deal with a few new realities during treatment: restrictions on foods, limitations with mouth function, and (perhaps) embarrassment over your new “metallic” smile. There's one reality, though, that trumps all others in importance: your risk for developing dental disease increases significantly during orthodontic treatment. The brackets and wires of your braces make it more difficult to remove bacterial plaque, the main cause of dental disease, which allows places for disease-causing bacteria to thrive. To combat this, you'll need to step up your hygiene efforts to remove daily plaque. One sign your efforts might not be getting the job done is red, swollen or bleeding gums. Although gums can swell in reaction to the braces themselves, it's often because plaque-induced periodontal (gum) disease has infected the gum tissues. Gum disease is an aggressive infection. If it isn't stopped it can damage the gums and underlying bone that support your teeth — damage that could eventually lead to tooth loss. To stop it, we must remove plaque from all tooth and gum surfaces, even below the gum line. In some advanced cases it may even be necessary to remove the braces to better treat the disease. That's why preventing gum disease through effective hygiene is so important. Besides continuing routine visits with your family dentist, you should also brush and floss every day to remove plaque. 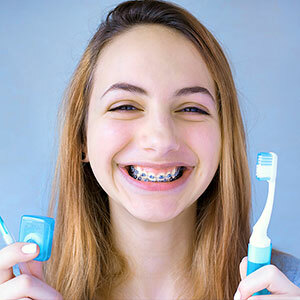 Be sure you're brushing above and below the braces. It may be helpful to use an interproximal brush specifically designed to maneuver around these tight spaces. You can also use a floss threader or a water irrigator to make the job of flossing easier. If you do notice gum redness, swelling or bleeding, don't delay — call your dentist at once. An examination will determine if you have gum disease and to what degree, which will guide treatment. The sooner this happens, the less the impact on your dental health and your orthodontic treatment.